The team at The Clay Company is a close knit one – a small group of hand-picked, like minded people who have come together for the love clay! And while our passion for clay is the overriding flavour of the culture of our business, we work hard to ensure we pick individuals who bring a high degree of professionalism and integrity to our environment. Our culture is structured but non-hierarchical, and the environment professional but fun. Production is done by experienced professional potters whose skill and experience is evident in the standard of work produced by them. the skill, ability and desire to unlock the creative potential in each student. So this is what we look for in each person when we appoint them as instructors in our studios! Our special interest workshops are often conducted by accomplished artists who have created a name for themselves in the world of art. But again, our aim in each workshop, is to offer our guests an unforgettable and enjoyable learning experience, so we chose our instructors to ensure we can deliver to that lofty goal. The team at The Clay Company is a close knit one – a small group of hand-picked, like minded people who have come together for the love clay! And while our passion for clay is the overriding flavour of the culture of our business, we work hard to ensure we pick individuals who bring a high degree of professionalism and integrity to our environment. Our culture is structured, but non-hierarchical, and the environment professional, but fun. Our regular classes are run by Instructors who have a degree in Fine Arts in ceramics/pottery OR have significant experience as practicing potters. But a degree is not enough to be an instructor at The Clay Company, because in our experience, the best potters/ceramists are not necessarily the best teachers. The most important qualification to be an instructor at The Clay Company, is to have the skill and ability to impart knowledge and teach, to have the patience and desire to unlock the creative potential in each student. So that is what we look for in each person when we appoint them as instructors in our studios. Aparna has spent 13+ years in the Corporate world in various leadership roles across Management Consulting and Business Process Outsourcing with companies such as PriceWaterHouseCoopers, GE/Genpact and Infosys BPO. She has worked in global roles in India and across Europe and has lived in New Delhi and London. Aparna has a Bachelor’s degree in Economics from St Stephen’s College, Delhi University and a Masters Degree in Business from Carnegie Mellon University, Pennsylvania. She discovered her passion for pottery and ceramics in 2004 quite by accident – when someone suggested she balance her stressful corporate life with a calming and therapeutic hobby – studio pottery. 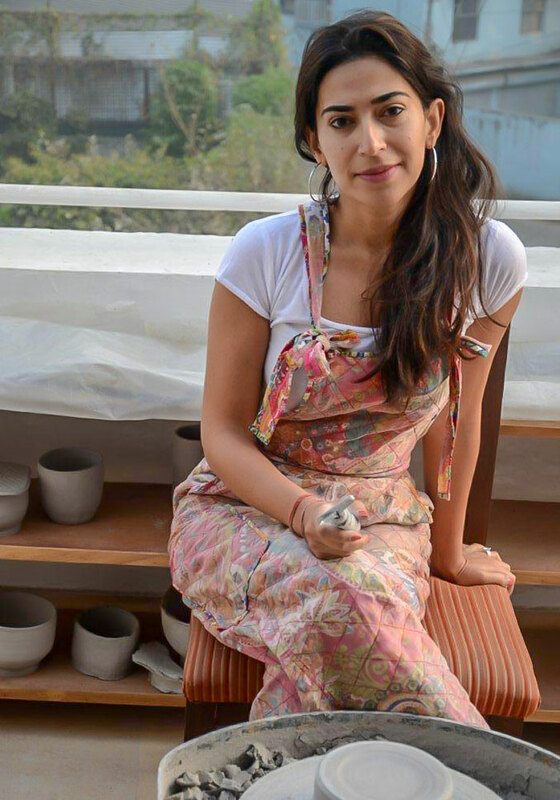 She started her lessons with an accomplished and talented potter Monica Grewal in New Delhi and almost immediately, she discovered a passion for Ceramics she never knew she had. Balancing a demanding corporate career with a passion, Aparna took breaks dedicated to pottery and ceramics whenever she could. She completed a course in Tuscany at The La Meridiana Ceramics School dabbling in porcelain and raku, and another in Sculpture at the Chelsea College of Art and Design, London. Back in India for a few years, Aparna went on to learn from one of the most well known Raku specialists in the country, Manisha Bhattacharya. Seven years down the road from her first introduction to pottery & ceramics, Aparna gave up her corporate career to set up The Clay Company – a company that aims to make the joy & passion of ceramics accessible to anyone interested in working with clay. In May 2011, she conducted a pottery workshop at the Alliance Francaise, in New Delhi. In July she conducted a workshop with Manisha Bhattacharya for IFCI with Indus Art Live. And since then, The Clay Company has conducted a number of workshops in Delhi as well as at our outdoor studio in Rishikesh. In Dec 2015 The Clay Company opened a studio in Nehru Place in New Delhi conducting regular workshops and classes. Shriya manages our Nehru Place studio and runs the complex schedules of classes, production, bisque firings, glaze firings, material ordering, housekeeping and pretty much everything you can think of! She makes sure the studio is an inviting place – clean, and organised, fun and interesting. Making sure the temperature is comfortable and the music is just RIGHT! A place where creativity flows and our guests feel at home. For us, she makes the studio the lovely place of warmth it is! Because Shriya is a ceramic artist and designer herself, she brings her expertise to the studio in so many lovely ways… she takes classes and is always advising students on how to make their pieces more interesting. That apart, she leads production for us, and making sure we are delivering all our orders on target every single time. She took to the medium of clay early under the mentorship of the well known artist Ms. Manisha Bhattacharya, and later joined the Indian Institute of Crafts and Design, Jaipur, for post graduation in ceramic and glass design. Shriya further honed her technical and design skills under artists like Ms. Rachna Parashar and Ms. Shirley Bhatanagar. A former intern at Dakshinchitra, Chennai, she has worked with traditional potters and other craftsmen working in materials like glass, soft stone, palm leaves etc. She was also an intern at Clay Craft, a leading bone China company in Jaipur. Her wide spectrum of studies and projects equipped her with proficiency in different departments of her art – clay bodies, glazes, firing techniques, surface decorations etc – besides giving her a working knowledge of other genres and mediums of craft, such as textile, wood, paper, metal etc. Shriya has worked with Apparao Galleries in Delhi and Chennai as an artist as well as a member of the management team. As an independent artist, Shriya Kastuar has worked on a range of ceramic products including pots & vases and utility, decorative and jewellery products. She has designed and produced ceramic installations for luxury hotels and resorts and created terracotta sculptures working with master potters of national repute. A graduate in History from Miranda House, Delhi University and a former student of Indian classical dance- Kathak at the Kathak Kendra, New Delhi, she uses her teachings and lessons from the different fields of history, art and design as inspirations in her works. Ashok Kumar Prajapati or Ashok ji as he is called by everyone at the studio is a very talented potter from Delhi’s potter community of Uttam Nagar. Born in New Delhi’s Sarai Rohila to a simple potter, Ashok ji comes from very humble beginnings. Without any formal education in ceramics or pottery he is a self-taught, highly skilled professional and an excellent teacher. A potter with progressive and modern thinking and an extremely inquisitive mind, Ashok ji brings to The Clay Company his incredible pottery skills in different roles – an excellent and patient teacher and a dedicated production potter. Understanding the nuances of pottery, Ashok ji uses his knowledge of clay to bring to life TCC ideas and designs. Ask him for anything from throwing, turning, slab building, saving a cracked piece or getting a fun project going in your LYOP session. Everything clay is possible with Ashok ji around! With an equal passion for singing and music, he often gets his own playlist of retro hindi music to the studio to create a fun session. You may also hear him humming along in some of the sessions. A wonderfully patient, wise, and progressive personality, his quiet presence is a joy to have around the studio! Mahendra ji as he is called by everyone, is probably the most important man in our studio. He is the one who keeps the studio clean and makes it a place we all enjoy working in. And frankly, he does all the ‘un-fun’ stuff (and there is a lot of that in the muddy world of clay!!) so the rest of us can focus on being creative and enjoying the time we spend in the studio. He handles the day to day maintenance of the studio, making, recycling and preparing clay, assisting in glazing, keeping the wheels clean, keeping tools organized, ensuring the plants are watered and the kitchen and washroom are clean and in proper working order. Bhim Singh Negi is our studio assistant at the Rishikesh studio. He has been with Aquaterra Adventures since 2004 which makes his association with our sister concern, over 14 years! And while at Aquaterra he is a man of different skills – preparing tents, serving food, doing all kinds of maintenance jobs, managing water supply, to mention just a few. He has been working with The Clay Company at the Rishikesh studio for the last 4 years, handling all pottery related jobs from preparing the studio for residencies and workshops, prepping the wheels, handling and assisting in firings, etc. He is the quintessential ‘one-man army’ who manages almost everything single-handedly! Born in 1968 in Garhwal, he is the youngest of 8 children. He lost his father 27 days after his birth and was brought up by his mother with immense love and care. After finishing his high school, due to shortage of teachers, he started teaching in a nearby primary school and was there for 2 years but due to less students and reduced salary, he decided to leave his teaching job. In 1988 he joined a dam construction company, studying the levels of the Ganga river, which he enjoyed and worked in, with passion. However due to the project being unsuccessful, he had to leave this job in 1998. He then joined a construction company as a labourer and till 2004 became part of many house construction projects. When on leave he works at his farm land and hopes to make agriculture a major income source for his retirement, which we hope for our sake, is a long way off!